Fifa is investigating allegations two of its officials offered to sell their votes in the contest to host the 2018 World Cup ahead of December's ballot. President Sepp Blatter admitted the scandal has had a "very negative impact" on the world governing body. Reporters from The Sunday Times posed as lobbyists for a consortium of American companies who wanted to bring the tournament to the United States. Amos Adamu and Reynald Temarii allegedly asked for payments. 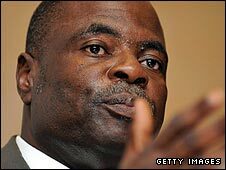 Adamu, who serves as a Fifa executive committee member, allegedly said he wanted $800,000 (£500,000) to build four artificial football pitches. This would be completely against Fifa's rules. The Sunday Times footage appears to show Adamu asking for money to be paid to him directly for endorsing a US bid. In the video, he was asked whether the money for a "private project" would have an effect on the way he voted. Adamu, who is president of the West African Football Union, replied: "Obviously, it will have an effect. Of course it will. Because certainly if you are to invest in that, that means you also want the vote." Temarii, president of the Oceania Football Confederation, is also alleged to have asked for a payment, in his case to finance a sports academy. Blatter has written to the 24 executive members promising a full investigation. The letter says: "I am sorry to have to inform you of a very unpleasant situation, which has developed in relation to an article published today in The Sunday Times titled 'World Cup votes for sale'. "The information in the article has created a very negative impact on Fifa and on the bidding process for the 2018 and 2022 Fifa World Cups. "Some current and former members of the executive committee are mentioned in the article." He adds: "Fifa will... open an in-depth investigation, which we will start immediately together with the Fifa ethics committee and the Fifa secretary general. "I will keep you duly informed of any further developments." Fifa has the option of postponing the vote, which is set for 2 December. The Oceania Football Confederation confirmed it was investigating the reports. It issued a statement saying "OFC is aware of the story that appeared in The Sunday Times in England. As such, OFC is currently looking into the matter." England, Russia and joint bids from Netherlands/Belgium and Spain/Portugal are vying to host the 2018 World Cup. The United States - the last remaining non-European bidder - pulled out of the race on Friday. Australia withdrew its candidature in June. Both will refocus their efforts on 2022, alongside Japan, South Korea and Qatar. Former sports minister Richard Caborn told the BBC he was pleased Fifa's ethics committee was looking into the corruption allegations as a matter of urgency. He said: "It is operational. It is effective. It is transparent. And I'm pleased to see that Fifa has acted decisively on this. We shall await the outcome."